For the fourth time in five years ['17, '16 and '14], we are spending a weekend in January or February at Sea Ranch with the Sanborns. This also marks the fifth time in seven years [2013 and 2011] that we have spent a long weekend at Sea Ranch in the winter. The Sanborns rolled up to our house in Carmichael a little before 9:00 am. We loaded up Phil's truck and were on the road just before 9:30 am. When Jack, Sharon and I were in San Francisco last summer, we had a bottle of MacPhail Pinot Noir for dinner. We liked it and I researched where they were located. It turned out that they had a tasting room in Sebastopol. I made a reservation for noon. Their tasting lounge is in an area called the Barlow. We got there about 11:30 am; the traffic was very light. We wandered around the area a little before heading to the tasting room. We had the tasting room to ourselves. After the tasting, we had some sandwiches for lunch in MacPhail Tasting Lounge Soil Room. After a quick stop in Bodega Bay for some crab and smoked salmon, we headed north to Sea Ranch. The traffic continued to be very light. We rolled in Gualala just after 3:00 pm. We are staying the next three nights at the Kyuka House. This is one of the two houses that we rented in September of 2016 for the anniversary trip. Sharon and I went for a two mile walk along the bluffs before dinner. 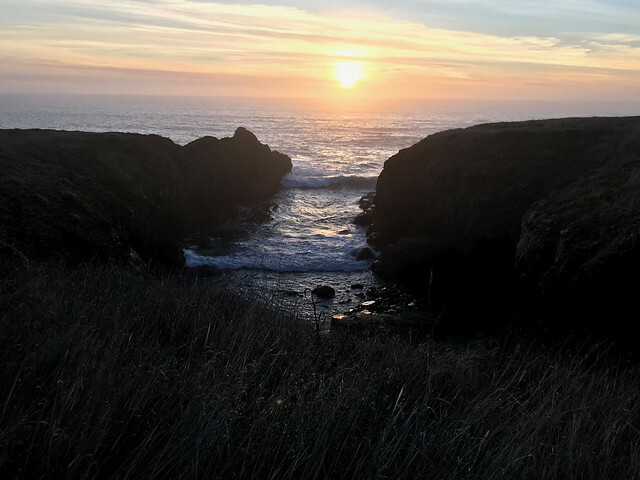 I have always loved sunsets on the ocean at Sea Ranch.